The “Gauchos del Mar” brothers pursue their goal of surfing at one of the southernmost areas of the world: “Isla de los Estados”. They travel with a truck and live in a tent across the Patagonia Region during six months, where they share their experiences with native people and get to know their crafts. They show the endemic flora and fauna, and fight against the harsh weather conditions to reach Ushuaia. 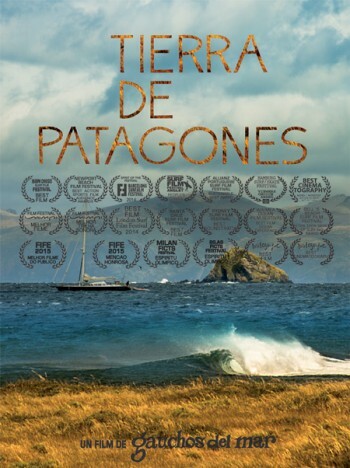 Where they board a sailing boat and sail through the Beagle Channel and across the Straight of Le Maire, which is one of the most dangerous seas in the world, to get to the uninhabited island. Subtitles: Japanese, French, German, Spanish, English and Portuguese. Production Company: Gauchos del Mar. Directors & Producers: Joaquín and Julián Azulay. Script: Gaspar Segafredo, Joaquin Azulay. Camera: Julián Azulay, Joaquín Azulay, Santiago Bernaldo and Isabella Veliz. Edit: Julian and Joaquin Azulay. Music: Ines Bayala, Ignacio Seratti, Barbas de Sal, Tomas Murmis, Nacho Ezcurra, Cirilo Carrizo, Feliz Entierro, Martin Damian and Mariano Rodríguez.